We posted our first CBS All Access review back in the early days of the service. We were relatively kind to the fledgling service, which offered a large on-demand catalog as well as live streaming in certain regions. CBS All Access has had plenty of time since then to fix the concerns we did have, including excessive commercials and a relatively high price point. Now we're back with another CBS All Access review. Has anything changed? The CBS All Access user experience was pretty competent on all of the apps I tried. 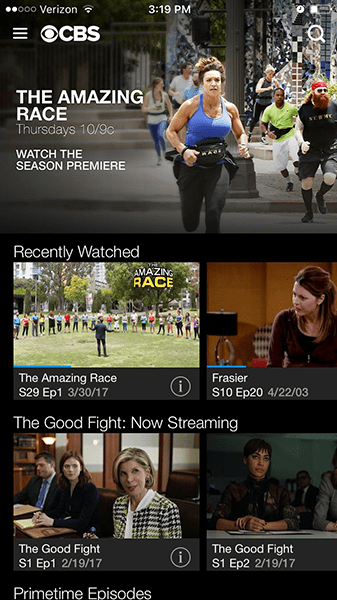 The apps sort the content into two basic sections – live TV and on-demand content. The on-demand content is further sorted into helpful sub-categories like “prime time,” so finding the right show for you is pretty simple. The app is good at getting you watching right away – the web app will even start playing something while you choose. The video controls are pretty easy, though I was not able to pause live TV in my trials. 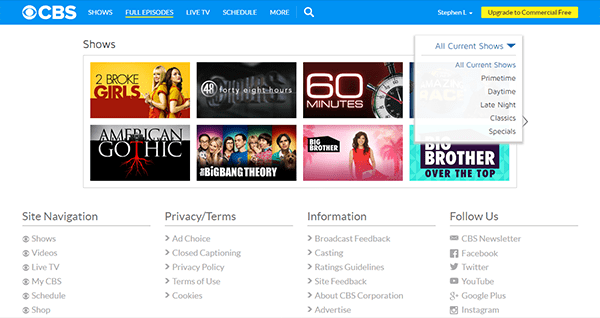 The primary appeal of CBS All Access is the live stream of CBS that is available to many – but not all – subscribers. If you live in a participating region, you'll be able to watch CBS live online through CBS All Access. Here is a list of the markets where that's possible. One major improvement since our first CBS All Access review has been the inclusion of NFL on CBS. NFL games were blacked out on the live stream when we reviewed the service last fall, but that changed this past December. That's huge news for NFL fans. The on-demand content here is quite robust, with over 8,500 episodes of CBS network shows available. Unfortunately, you'll have to watch commercials at various points during your show unless you're willing to upgrade to the $9.99/month commercial-free plan – which will remove ads from the on-demand content, but not from live TV. As for the shows themselves, you know the drill: CBS has hits like The Big Bang Theory and NCIS. You'll also be able to watch episodes from older shows like The Twilight Zone. Streaming quality was decent on CBS All Access, but this won't be the most praise-filled section of our CBS All Access review. I found video quality dipped at times, and when I used a mobile device without Wi-Fi, I had some significant troubles and even had my video time out on me. That may have had to do with my network (Verizon) and the service I was getting at the time, but other apps tended to do better than CBS All Access in this situation. Generally, though, the streaming quality was pretty acceptable. It didn't blow me away, but the video stayed in HD for the overwhelming majority of the time and was generally pretty smooth. Device support is a strong suit for CBS All Access. You'll be able to watch on Apple TV, Fire TV, Roku, iOS, and Android devices, plus the PS4, Xbox One, and on your computer via the in-browser app. Chromecast is also supported. CBS All Access will set you back $5.99/month for the standard plan, which includes commercials in on-demand content. Since our first CBS All Access review, CBS has introduced a new commercial-free plan for $9.99/month. As I mentioned earlier, however, “commercial-free” only applies to on-demand content – live TV will still have commercials, just as it does with cable or over-the-air. The really good news is that, like many other streaming services, CBS All Access offers a free trial. While we've outlined a great deal of what works and what doesn't for CBS All Access, it's always a good idea to try a service out yourself before you pay anything. Check out the CBS All Access free trial here. CBS All Access has improved since our first CBS All Access review, but my reaction is still pretty much the same. The big appeal here, to me, is the access to live CBS streams. But $5.99/month is a little steep for just one channel – for $20 or $30, you could sign up for Sling TV or DIRECTV NOW and get all four major networks and a bunch of other channels as well. And that's to say nothing of the overpriced $9.99/month commercial-free option. CBS All Access is a quality service, but for the price tag to be worth it, I think you'd need to check a few boxes: you'd need to be a die-hard CBS fan (and not care much about other channels); you'd need to be in one of the markets that gets a live CBS stream as part of CBS All Access; and you'd need to not have a better option for getting CBS, like over-the-air broadcasts. If all that is true of you, I wholeheartedly recommend CBS All Access. But if one of those things isn't true of your situation, you may want to consider a skinny bundle or an over-the-air antenna. I love CBS All Access. I have a digital antenna to watch TV and use CBS All Access all the time, especially when grandchildren want something. I can watch my show when they sleep. Cheaper than cable. I have a problem with the strategy/premise of this service, and to me, it looks like CBS is pretty greedy. I don’t have a problem, per se, with CBS offering an upgraded pay service like this (although 5.99 a month seems steep like the author states). But there also should be another baseline FREE CBS streaming channel for everyone paying for CBS already through their cable provider! For example, on my Roku, I have the NBC, ABC, Fox, and CW channels – all of them are free. Where is the CBS version of these channels?! I would be more drawn to this service if they included all episodes of their current shows instead of just the last 7 episodes. Being able to watch ‘Big Bang Theory’ from start to finish would make worth the $9.99. The appeal of streaming service is a very large selection of content. CBS does not have enough content to be worth $10 a month, or even $5 a month. The same applies to Disney. I cut the cord several years ago when Comcast jacked the cable TV bill up from about $55 to $140+ a month, while utility dropped. Content providers think they are going do the same with streaming, but if that happens I will continue to increase content on my own server, and simply drop streaming services. REALLY! YOU ARE LOW LOW LOW. Just found out that the new Star Trek series is on this streaming service ONLY. RIDICULOUS. Thanks for trying to lure trekkies to buy your streaming service. I am very UPSET by the creators of this new Star Trek series for limiting viewing to many people who love/like Star Trek. You are being GREEDY. And, you are making hard for newcomers to Star Trek to continue the legacy of Star Trek with a new show. I won’t pay for it and – thanks for making me miss out the new series. I mean I pay enough for my Comcast cable. You say that it is “only $5.99/mo.” But $5.99 here and there adds up to a lot. So the people that I am MOST upset with – because they are uncaring and greedy to make money without consideration to people’s feelings – are the CREATORS of this show for limiting its viewing ability and selecting CBS All Access to air it on. REALLY! So, I will say that if this show isn’t good enough for NBC or ABC or another top network found on regular cable (which I already pay for), then this new Star Trek show must not be as good. I will not be manipulated to sign up for CBS All ACCESS or any streaming service just to watch this new show that is a bait to pay. AGAIN, RIDICULOUS. I don’t need to watch this new “STAR TREK” SHOW to still be a big trekkie. Signed up for this so I can get a few shows and sunday football. Got an email from CBS today saying there is double header on. I sign in and get paid advertising. I pay a monthly fee and still have the paid hour long commercials. The service is really not worth it unless you take advantage of the old shows. Even then there are loads of commercials to deal with. Seems like greed to me. Oh, and try to find a way to contact someone… takes a long time to filter through. Does the CBS soap operas play on Roku (The Young and the Restless and The Bold and the Beautiful)? Does anyone know how to get the Fire Stick to show the right local channels for CBS All Access? Our is showing the wrong local channels. We purchased the 1 year plan with the hope of watching NFL games broadcast by CBS and a few other programs. The network programs have worked just fine but the NFL broadcasts have not. Three weeks we had no access and several others the broadcast had a horrible picture to the extent that we were unable to watch. I don’t understand the problem but we contacted CBS customer service informed them of the problem and nothing has come of it. They are really bad at streaming NFL games.